8 a.m. It was already uncomfortably hot, not unusual for September in New Orleans. I was seated in a truck, and two sleek kayaks were strapped down in the back. A colleague at the University of New Orleans, John Hazlett, was at the wheel. He was going to take me kayaking down Bayou Trepagnier and Bayou LaBranche, part of the LaBranche wetlands. 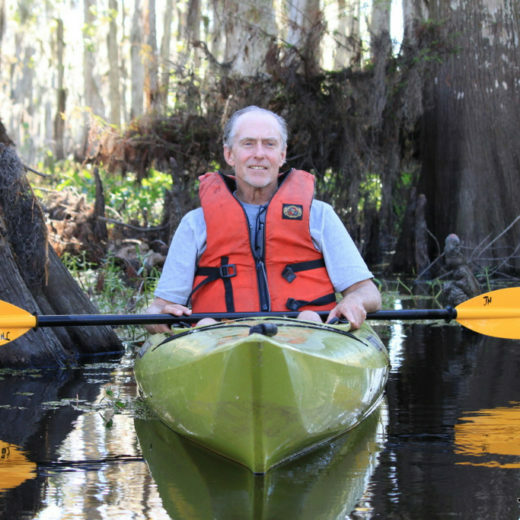 John teaches nature and travel writing, and is very knowledgeable about the wetlands and bayous in southern Louisiana. Even though I didn’t know him that well at the time—I had arrived in New Orleans recently from New York—he had generously offered to take me with him. I’d never been on a bayou before. The day pulsed with newness. We passed by the houses in his neighborhood, some shabby, looking rattled, perhaps never having fully recovered from Hurricane Katrina. Within a few minutes, John eased the truck onto Interstate 10, and we headed west. As we talked, I could see that he was affable and open, prone to laugh, and that he had a dry humor that bordered on the aphoristic. We passed car dealerships and strip malls, typical urban outreaches. Then we split off onto a spur, raised high above the ground. Suddenly all civilization was gone. We traveled by nothing but cypress trees. One after another, they had Spanish moss hanging from their branches in long gray veils as if they were in mourning. Even though John had made this trip countless times, he was still amazed at the abrupt change from city to wildness, as was I. A few minutes later, dust billowing behind us, he turned off the road. I saw the beginnings of some water nearby. This is where we’d put in. We unfastened the kayaks and carried them to the fringe of the water. It was murky-gray, warm. In the distance, I saw the huge, Samson-like concrete pillars of Interstate 10, colossally embedded in the water, one after another. I straddled the kayak and lowered myself carefully into its cockpit. I didn’t have much with me—just two bottles of water, a few sandwiches, sunscreen, and binoculars. Ensconced, I pushed off the bottom with my paddle. My kayak freed itself, and then, like a skater, I was gliding. We moved across a small lake-like body of water that narrowed gradually. There was no current to fight. Soon I was in a different world—the wetlands. The waterscape was wide and lonely and nearly empty. It was a kind of water desert. Few things grew in that brackish expanse. The beauty of the place was sculptural, with naked dead trees here and there, some with branches in haphazardly arresting arrangements. Much of the water was very shallow. Our kayaks slid into solidness occasionally, got lodged, and we had to push off with our paddles. We made our way through grass and marsh on the widest passageway we could find. To the far horizon, there was no one else there but us. We kayaked to another section of the wetlands, a place created, John told me, after the last hurricane careened through a few weeks earlier. Before that, much of it had been dry land. This is the way things are in Louisiana, especially in the southern part of the state, which is crisscrossed by little rivers, lakes, streams, and bayous. The land being marshy and weakly-established, the shorelines are always shifting, and sometimes they disappear, never to return. The state’s Gulf of Mexico coast is losing about 43 square kilometers of land every year—nearly one football field every hour. Nothing is ever permanent anywhere, but here in Louisiana impermanence is strikingly normal. John paddled his kayak toward a channel-like opening to the side, and announced that we were heading into Bayou Trepagnier. And so there I was, about to enter a place that has, in its own way, become more than simple geography. It’s become an idea. The bayou. The definition of “bayou” (from the Random House Unabridged Dictionary) is “a marshy arm, inlet, or outlet of a lake, river, etc., usually sluggish or stagnant.” The origin of the word is not French, as you might expect, but from the Choctaw word, bayuk, meaning “river forming part of a delta.” Some bayous have water that is opaque or the color of weak tea. Some have water that is clear, so that you can see the bottom. Some are wide, with foliage so sparse that they provide not a patch of shade. Others are narrow and have trees and bushes along the banks, casting their long shadows on the water. You do want shade on a scalding Louisiana day. But whether wide or narrow, shady or exposed, all the bayous we kayaked were still or nearly without current. None were stagnant as the definition claimed. We paddled down Bayou Trepagnier, sighting beautiful birds. We saw white ibises, a bird that the ancient Egyptians worshipped. We saw egrets, black-necked stilts, tricolored herons, ospreys, pileated woodpeckers, a barred owl. Some had huge, Icarus-like wingspans, notably the herons. They were sensitive to our approach, alighting two or three hundred meters from us even as we drew near almost soundlessly in our kayaks. It was lovely to see the herons fly off like enormous white fans. We saw a great blue heron, tall, huge, solitary—breathtaking at the edge of the water, a statue, the ultimate strong silent type. Any bird that lives alone, aloof and self-reliant, has a kind of unassailable strength. A place like this can make you forget civilization. I could see how content John was. It was as if he’d found his rightful place in the world, at least for a few hours. John’s roots are in Iowa, but this waterlogged, seething landscape had clearly captured his heart. He had all sorts of gear with him—two cameras, binoculars, fishing rod, a case with different lures, food, gloves, and God knows what else. We saw eight or nine alligators, three or four of them intimately. I’d never seen an alligator in the wild, in its own habitat. The first time, I was both thrilled and slightly afraid. John had a much better eye for these antediluvian animals than I did. I soon found that if they weren’t exactly shy, they weren’t aggressive either. If an alligator was on shore basking, it would slide into the water when approached. I loved seeing an alligator out of the water, on shore, long mouth shut with that slightly sly smile. It was inscrutable, a reptilian mystery, with its corrugated impenetrable skin, a knight in un-shining armor. The gators we saw were not huge, but they were still formidable. Mostly, we saw them in the water, their periscope eyes just above the surface. They surveyed us. As we kayaked toward them, they descended, and disappeared. We surprised a gator once on shore, and it slid quickly into the water. We paddled slowly, looking down. The water was clear and shallow, just knee-deep. Suddenly, there, directly below me, was the alligator, looking up at me. I could see all of it, perfectly. It was disconcerting to see this alligator, in its element, watching me. I felt like my kayak could flip over at any moment. The day flowed easily, even with the caustic heat. At a certain point, I realized we’d been out for at least four hours, yet it didn’t feel like that at all. There is a sense of the eternal in this landscape. Time seemed accommodating. Time seemed unhurried. A long day on the bayou like this tends to provoke talk, often of a ruminative and wayward nature. Even though I didn’t know John well, the combination of easy paddling and lulls made for talk that glanced from subject to subject, all effortlessly. A conversation like that would be very difficult to have on land, back in New Orleans, with the constant barrage of phones and responsibilities. In the bayou, though, was the encouragement of space and time, of a continuum of quiet. Isolated and protected by the bayou’s exquisite harshness, we could speak as openly as we wanted. There was no one for kilometers, and we could sense that. I found myself telling John all sorts of things men would normally be reluctant to say to one another, even to close friends. It wasn’t anything really revealing, because that suggests something scandalous or embarrassing. It wasn’t that at all. We talked about growing old, about the indignities of aging we would face soon. We talked about fathers. We talked about the women in our lives. We talked about our children. This talk came and went, ebbed and flowed throughout the day. At one point I became incredibly moved by my conversation with John. I realized how little I reveal to other men. Here, in this swampy place outside of time, I was making a friend. We moved on. Some of the trees we passed I knew, others not. John pointed out bald cypress, tupelo gum, mangrove, privet, willow. At a certain point we passed swaths of white spider lilies. The extent of them was surprising. I would say there were fields of them, but there were no fields there, only marshy plots with the dead fingers of trees rising among them. Still, it was uplifting to see color—if only white—established there. It made me feel optimistic, to find flowers thriving in this morass. Some of the banks of the bayou were a mess of detritus from the last hurricane. It was the kind of mess that’s always repulsive, filled with mats of beaten bamboo, plastic bottles, small blindingly white styrofoam buoys, nylon-rope fragments. No one can turn nature ugly like humans. What else did we encounter? We negotiated a bend, and came upon an old hunting cabin in the middle of nowhere. It had a deserted feel to it, like the Inner Station in Conrad’s Heart of Darkness. It had been tilted by storms so that doors were cast open to reveal an old stove and even cots. This was a place men would use as a base for their duck hunting. We saw others. One had even been raised by a violent storm from the ground and was in a tree. Hurricanes can do anything. We stopped by one of the cabins, attached our kayaks to the shore and crawled through underbrush to have a closer look. It listed madly, and it wasn’t easy to get inside. What was it like to build this here, to bring in a stove, propane tanks, and beds? Before we knew it, it was late afternoon. It was time to head back. On our way, as part of the long day on the bayou, we talked about what it would be like to glimpse the ivory-billed woodpecker, one of the most gorgeous birds ever to grace our world. The last substantiated sighting of the ivory-billed was, in fact, in 1944. But in 1999, there was an unconfirmed sighting of a pair of these mythical birds just east of the town of Pearl River in southeastern Louisiana, not far from here. All of us let that beauty disappear forever, and so the thought that one or two of these magnificent creatures might still exist somewhere could give us hope for redemption. For an hour or so, John and I peered into the underbrush and up into the trees with our binoculars, searching, in vain, for a flash of a gleaming white bill. We kept searching, because the bayou is secretive, and the impossible doesn’t seem unlikely. It was around 5 p.m. The temperature was still oppressive. We paddled toward home. It had been a long day. We’d been out on the water nearly eight hours. I was spent, but I was exhilarated. We rounded a bend, and I saw the truck near the edge of the water. I was grateful, yet melancholy at the same time. I’d been to a new world today, and I wasn’t entirely sure I wanted to return to mine. Cite this Article: Richard Goodman “Down on the Bayou,” Hakai Magazine, Nov 12, 2015, accessed April 23rd, 2019, https://www.hakaimagazine.com/features/down-bayou/.